What Does it Do? : When you unlock it, nothing. 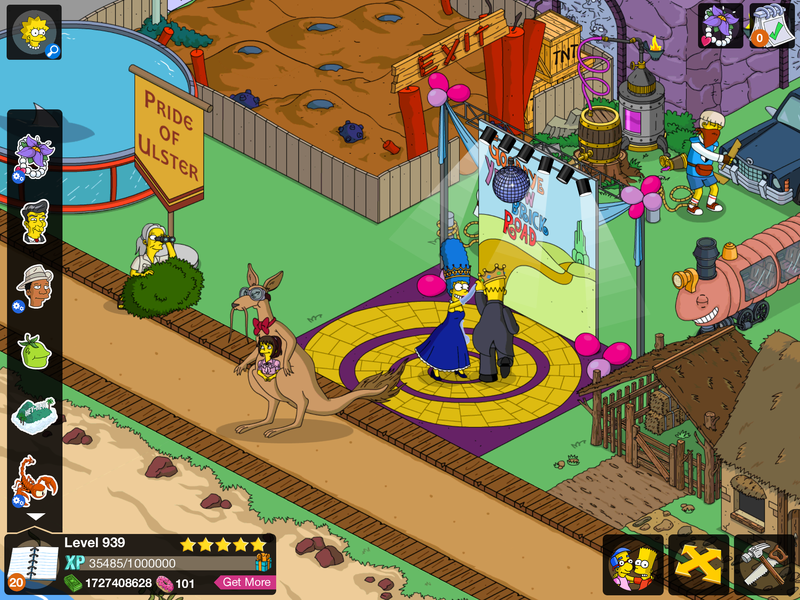 After you unlock the next prize Homer and Marge will have a joint task there. 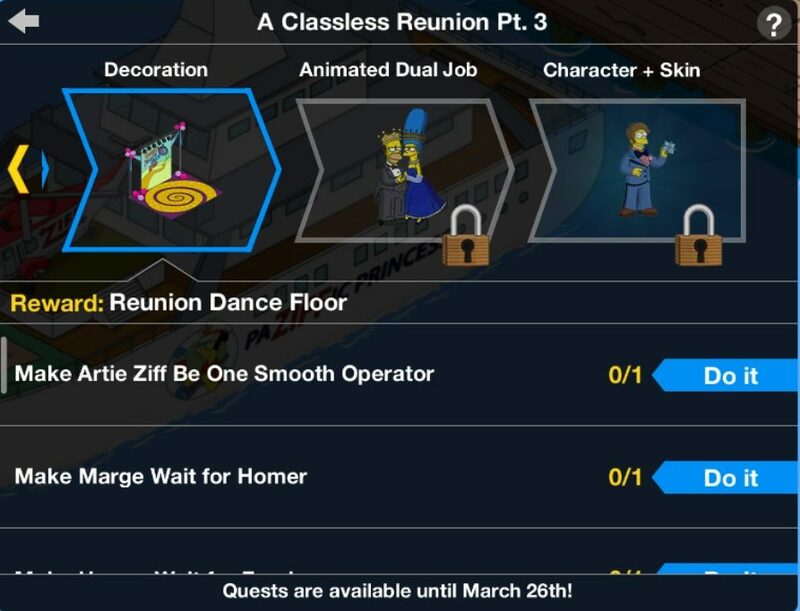 And that’s it my friends, the details on the Reunion Dance Floor, the third prize on the Classless Reunion mini-event prize track. Thoughts on the dance floor? Do you remember it from the show? Where have you placed it in your Springfield? Sound off below, you know we love hearing from you! 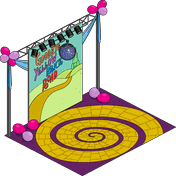 This entry was posted in Classless Reunion, Decorations and tagged Classless Reunion Dance Floor, classless reunion prizes, Tapped Out Tips and Tricks, task at the reunion dance floor, The Simpsons Tapped Out, TSTO Addicts, TSTO Tips and Tricks, what does the reunion dance floor do. Bookmark the permalink. Today is my birthday (🎂 woo-hoo!) and I’m celebrating by making pork Schnitzel with a lemon caper sauce for dinner…yum! My sister made an awesome almond pound cake, so we’ll have that with a fresh berry compote and real whipped cream for dessert…we’re going to stuff ourselves! Happy Birthday. Your birthday dinner sounds fabulous. I hope you enjoy it. Thanks, was great, but I ate too much😁. Happy Birthday to the greatest TO designer I know! Thanks…so far, having a great day 👍😁. Leftovers for lunch tomorrow…be here by noon😆. Happy birthday. Thanks for the inspiration in both your designs and recipes. Just having fun with my town🤪…glad you enjoy the designs😄. Sounds delicious! Happy Birthday. And to all a Happy Spring. Thanks…all the azaleas are blooming their hearts out. I really love spring around here😁. Oh wow, how nice. Our flowers are starting to peek out of the ground, but here in Northern Ohio, it may be Spring, but the weather doesn’t reflect it yet. But before you know it, I’ll be putting my hummingbird feeders out! Happy Birthday! I always marvel at your designs:). Enjoy your special day! !